Abuja - Nigeria's president on Wednesday vowed to "redouble" efforts to secure the release of nearly 200 schoolgirls who remain missing more than two years after being abducted by Boko Haram extremists. President Muhammadu Buhari met for the first time with the 21 Chibok schoolgirls who were released last week after negotiations with Boko Haram. Buhari said they would be reintegrated into society "as quickly as possible". 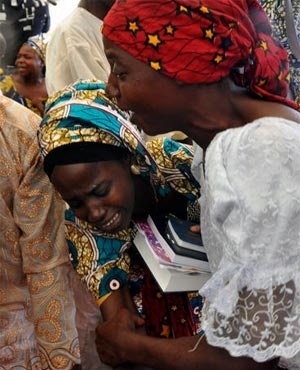 At least 276 girls were kidnapped from a school in the northeast town of Chibok in April 2014. Dozens escaped early on, and another was found in May. Last week marked the first negotiated release of any of the schoolgirls. One of the schoolgirls, Rebecca Malu, delivered brief remarks on behalf of the group at Wednesday's ceremony. "We are happy to see this wonderful day because we didn't know that we would come back," she said, adding that she was praying for the release of the others. Not all may want to come home. More than 100 of the schoolgirls appear unwilling to leave their captors, perhaps because they have been radicalised by Boko Haram or are ashamed to return because they have married extremists and have babies, Chibok community leader Pogu Bitrus has told The Associated Press. Bitrus said the freed schoolgirls should be educated abroad because they likely will face stigma in Nigeria. The president said the government will assume responsibility for the schoolgirls' personal, educational and professional goals. "These dear daughters of ours have seen the worst that the world has to offer," Buhari said. "It is now time for them to experience the best that the world can do for them."